Those skin tight shorts that female volleyball players wear aren’t just for looks, they actually serve a purpose. 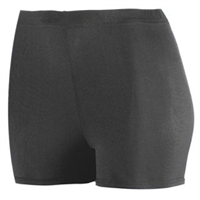 Similar to attire for gymnastics and track, the tight bottoms allow for better movement during a volleyball match. Women’s indoor volleyball teams tend to wear short, form-fitting bottoms like the Mizuno Vortex volleyball spandex shorts or volleyball baseline shorts and it is standard for beach volleyball players to wear bikini bottoms. Volleyball shorts are usually made of a lightweight spandex, the shorts worn by female volleyball players allow for more fluid and agile movement during play. The women do not have to worry about their bottoms slipping down or becoming bunched up while diving for the ball during a critical point. Players tend to have a greater range of motion and flexibility when their uniform is not getting in their way. Volleyball and More offers Volleyball shorts in San Antonio so if you want Mizuno volleyball shorts in Texas then you've found the right store. Be sure to get Mizuno volleyball cover up shorts in addition to Mizuno volleyball spandex shorts for warm ups.